View other properties listed in Listed Properties For Sale. If you would like to receive property information as soon as it is listed, we will be glad to keep you informed. You may reach James Land Company at our office at 307-326-3104. Or you can try Curt James on his cell at 307-399-8644 or Creed James on his cell at 307-399-7973. You may send an email, or contact by writing here. 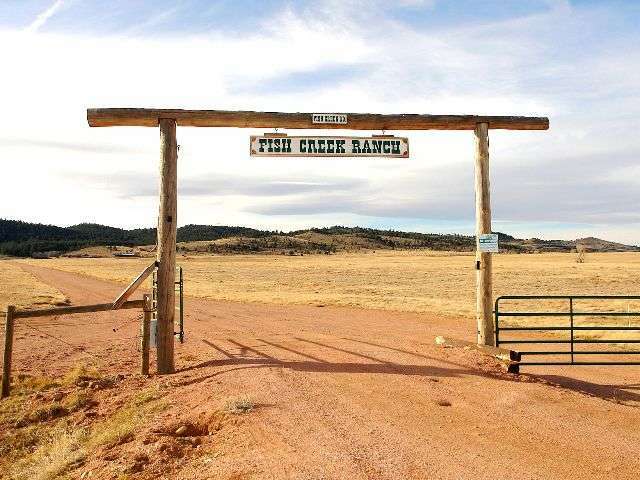 ���� Located between Laramie, Wyoming and Fort Collins, Colorado, Homestead 2 offers a rare and distinct ownership opportunity in the Fish Creek Ranch Preserve, one of Wyoming�s beautiful mountain ranches. Developed with the vision to preserve the western lifestyle for future generations, the ranch encompasses 4,242 acres with fourteen 35 acre �Homesteads�. The remaining 3,752 acres have been set aside as a private game preserve for all the owners to enjoy. The timber covered hillsides, lush bottoms and open prairie provide an ideal habitat for a variety of wildlife that call the ranch home including Mule Deer, Antelope, Bear, Grouse, Beaver, Moose and large Elk herds. There are five stocked ponds on the property that are fed by Fish Creek, providing excellent fishing opportunities for Brook and Rainbow Trout. ���� The subject property is unique as it is the last remaining developer�s lot. This gives the future owner the flexibility of being able to move the lot to a location fitting their wants and desires. There are utilities along most of the roads throughout the ranch giving the future owner options of where to place the lot. If you are looking for a lot with stunning views or timbered and private the ranch can accommodate. ���� The Fish Creek Ranch Preserve enjoys year round access and is an easy 2 hour commute from Denver. Bordering the ranch to the south, are thousands of acres of the Roosevelt National Forest that the ranch has a private gate to access. Owners in the ranch benefit from having a full-time resident Ranch Manager who is responsible for maintaining the ranch, caring for the horses, road maintenance, trail grooming, and security of the private residences as well as the commonly owned preserve. During the summer months, the ranch has horses available for the owners and guests to ride on the countless trails throughout the ranch. ���� A private setting with expansive mountain vistas, stocked fishing ponds and abundant wildlife, have made the ranch one of the most relaxing and enjoyably ownership opportunities for the outdoorsman that you can find. By purchasing one of the homesteads in the Fish Creek Ranch Preserve, owners receive a 1/14 undivided ownership interest in the shared amenities on the ranch which include the ranch manager�s home, barn, equipment and acreage. To arrange a time to view this spectacular private retreat call James Land Company today!